First a reader question: Could these be antediluvian (pre-Flood)? I doubt it. The Rising Star Cave where these fossils were found is in a very old dolomite (Monte Christo Formation), possibly pre-Flood, but that doesn't tell us when the cave itself was carved. I would not expect a cave like this, with an opening to the surface, to survive the Flood as intact as it is. This looks more like a post-Flood accumulation of bones. Finally, all hominin fossils previously known are considered post-Flood by most of the creationists that should know about these sorts of things. So I'm working under the assumption that these are post-Flood fossils, until someone gives a very good argument otherwise. Next, I wonder what can we learn about human history from this discovery? On the one hand, reporters occasionally overhype discoveries like this. A classic example is the hysteria over Ida. This time, things are different. This is legitimately a very, very exciting discovery, and I don't hear anyone claiming that this will change everything. Smithsonian magazine says it "may change what we know about human evolution," and National Geographic says that it "changes the human story. But how?" It's like everyone's being extra careful after the backlash from Ida. If Homo naledi doesn't change everything, then does it change anything? Let's think about this from a creationist perspective (since that's the framework I'm most interested in.) Can we learn anything about the human story from Homo naledi? Honestly, I think it's too soon to say for sure. IF H. naledi turns out to be human, we might learn something new about human history. Back in the early nineties, when I first got a copy of Marvin Lubenow's Bones of Contention, the fossil hominin story was fairly straightforward. There were taxa that looked very human. Homo erectus and Neandertals from the neck down look very similar to us. They're as tall as us and clearly walk around upright. There was no question in my mind that they were human. Then there were the australopiths, which were very different from us and therefore not human. That also seemed "obvious." Other taxa like Homo habilis and Homo rudolfensis seemed like they were too fragmentary to have a definitive opinion about. So I was happy. Aside from a few skulls, fossil hominins seemed like a clear case of these-are-human and those-are-not. Over the past twenty years, however, things have gotten progressively more complicated. We've seen multiple new australopiths and other hominins that have raised some interesting questions about humanity. I'm thinking especially about the discoveries at Dmanisi, where we have what appear to be Neandertal, H. erectus, and something even more "primitive" living side by side. Dmanisi suggests to me that we creationists have severely underestimated the possible variability of humanity. In a sense, we've been "tricked" by the homogeneous sameness of living humans. Dmanisi also excites me because it's right in the region where the "mountains of Ararat" are supposed to be. OK, it's not exactly there, but given the global geography of Homo erectus and Homo ergaster discoveries, it's remarkably close. So if Noah and co. were coming off the Ark, and their children were starting to look a little "different," wouldn't you expect that a population like the Dmanisi hominins would exist? I sure would. Add to that my infamous judgment about Australopithecus sediba. I was actually finishing a paper on hominin fossils in 2010 when A. sediba was announced, and that gave me an opportunity to test my results: Would A. sediba group with one of the existing groups I had discovered? Or would it collapse the groups into a single group (as evolutionists would suggest)? Yes, it grouped; no, it did not collapse the groups into one. The only "problem" (for some commentators) was that I put A. sediba in the human group, when to a lot of creationists it was "obviously" not human. Let's not forget the most important discovery from that study, though: Homo and Australopithecus did not just blend together into a single group. I did not find an unbroken line from nonhuman ape to human. I found, as creationists have always claimed, that there were two separate groups: one of which contains Homo sapiens, Neandertals, and H. erectus (human descendants of Adam and Eve), and the other contains nonhuman ape-like creatures like Australopithecus afarensis. As I think back over the dramatic advances in paleoanthropology since Lubenow's book first appeared, this result seemed like something very worth celebrating. It's too bad people freaked out about A. sediba and lost sight of the more important result. Revisiting that research is yet another reason why Homo naledi has me really excited. Here again, like A. sediba, we have a South African hominin with a very weird mix of traits and a skull that looks very "primitive." But this time, we also have a very interesting argument that these individuals were deliberately buried. Creationists have long considered burial as a sign of humanity, so what will this do to the argument? What will my baraminology study tell me about Homo naledi? How will H. naledi change our opinion of A. sediba? What will creationists learn about the human story from Homo naledi? 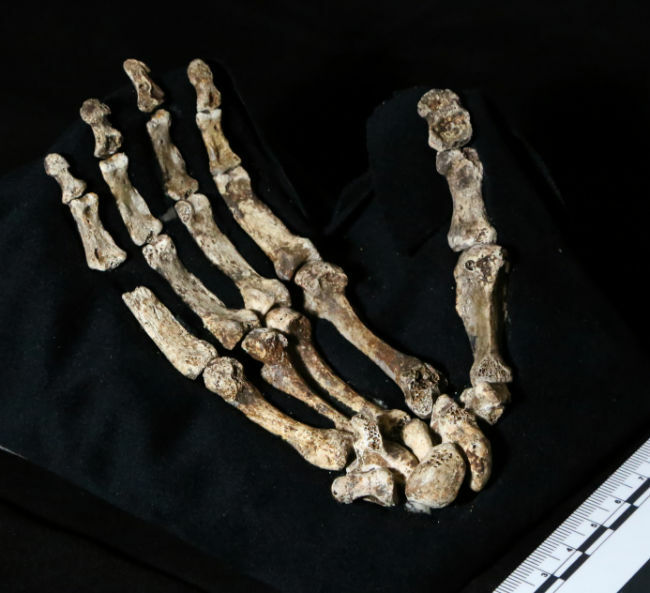 Photo of Homo naledi hand courtesy of the University of Witwatersrand.